I bought a bundle of ramen noodles recently at the Dollar Tree as an impulse buy. I thought it would be fun to incorporate them into a tasty soup or salad. When I was in college I loved ramen noodles, not just because they were cheap, but for their flavor. When I worked at Bloomberg News they offered them for free at the snack bar and it seemed like I ate a bowl or two a week for the three plus years that I worked there. I wanted to take these noodles to a new level though. I decided to go with a pepper steak theme. I started by browning the steak. Once it was just barely cooked through I remove it from the pot and started the aromatics – red pepper, onion, jalapeno, fresh ginger and garlic. Once they were soft I returned the steak to the pot with 5 cups of chicken broth and two tablespoons of sriracha sauce. Yup, TWO tablespoons! I brought it to a simmer, then added three packages of noodles. I threw away the little flavor packets that come with each bundle of noodles. After a few minutes they were ready to eat, just as if I were making them between classes or returning home for a snack after a night of debauchery back in college. I couldn’t get enough of this dish. I absolutely destroyed two bowls before I could even get the pictures for this blog done. 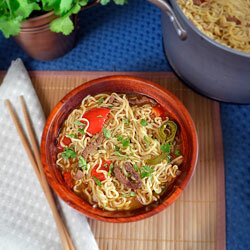 It was a great beef and noodle dish with a hint of Asian flavor from the ginger. The sriracha added enough heat to give it an addictive quality. 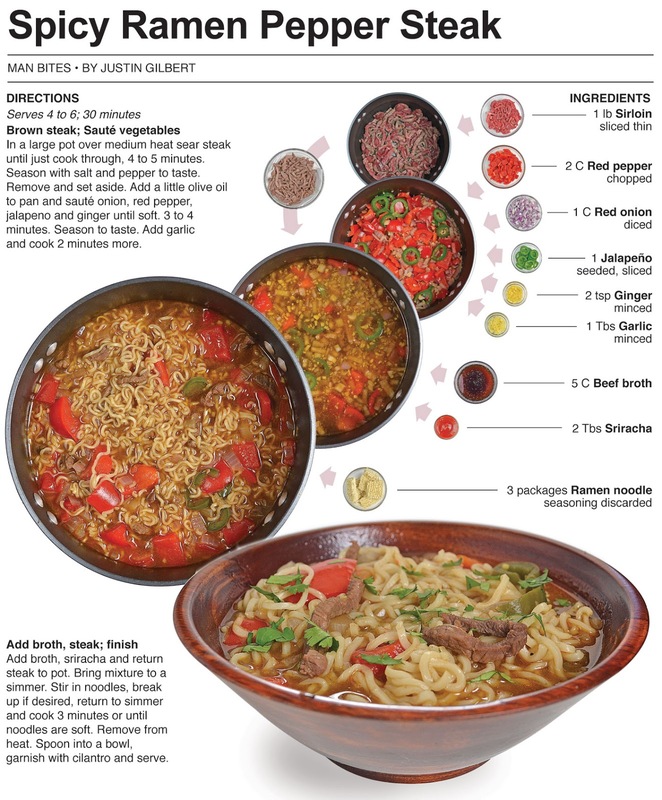 I think this is a great dish for a party and really shows how delicious ramen noodles can be – rather than just a cheap meal for college students. 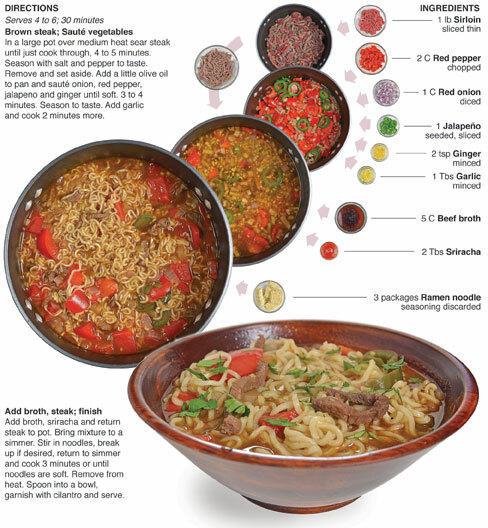 I learned something about ramen noodles when I made this dish – they don’t stop absorbing liquid. The first bowl of this recipe I consumed was like a soup. The second was more like noodles with a little broth - the next day it was just noodles! All the flavor was there, so nothing was lost - except the heat. As the noodles soaked up the broth it also soaked up the spice and made it less potent. The first couple of bowls really packed a nice punch with the sriracha, but the next day, with the liquid gone, the heat was really tame. My mom tried a spoonful when it was fresh off the stove and she complained that it was too spicy. She took a container to one of her friends who likes hot stuff. She ate it the next day and had the same experience as me - the heat disappeared with the broth! There was some spice but not like in the beginning. Even I thought it was spicy when I first tried it, and as my family knows, my mild is usually another man’s hellfire - so needless to say, it really had some kick at the start. I can’t wait to make this dish again, the recipe makes a large amount, so I think it will be a good dish to make for our first get together at the family camp ground – which should be opening in the next few weeks – weather permitting. In a large pot over medium heat sear steak until just cook through, 4 to 5 minutes. Season with salt and pepper to taste. Remove and set aside. Add a little olive oil to pan and sauté onion, red pepper, jalapeno and ginger until soft. 3 to 4 minutes. Season to taste. Add garlic and cook 2 minutes more. Add broth, sriracha and return steak to pot. Bring mixture to a simmer. 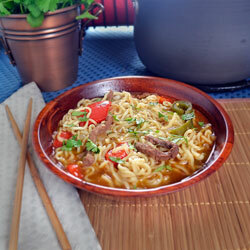 Stir in noodles, break up if desired, return to simmer and cook 3 minutes or until noodles are soft. Remove from heat. Spoon into a bowl, garnish with cilantro and serve. I completely love homemade ramen, there are so many places in LA to get great Ramen. I don't think I've had Top Ramen in about a decade, but this looks fabulous beautiful job!